As little Edgar Curtis lay on his porch, he remarked to his mother how the noise of the rifle range was black, the chirp of the cricket was red, and the croak of the frog was bluish. Edgar, like many other people, has synesthesia - a fascinating condition in which music can have color, words can have taste, and time and numbers float through space. Everyone will be closely acquainted with at least 6 or 7 people who have synesthesia but you may not yet know who they are because, until very recently, synesthesia was largely hidden and unknown. Now science is uncovering its secrets and the findings are leading to a radical rethink about how our senses are organized. 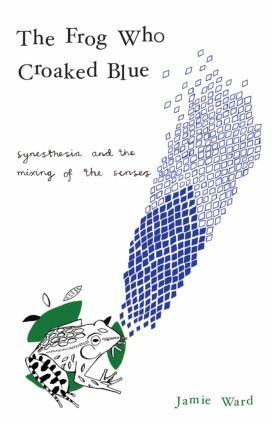 In this timely and thought-provoking book, Jamie Ward argues that sensory mixing is the norm even though only a few of us cross the barrier into the realms of synesthesia. How is it possible to experience color when no color is there? Why do some people experience touch when they see someone else being touched? Can blind people be made to see again by using their other senses? Why do scientists no longer believe that there are five senses? How does the food industry exploit the links that exist between our senses? Does synesthesia have a function? The Frog Who Croaked Blue explores all these questions in a lucid and entertaining way, making it fascinating reading for anyone with an interest in the intriguing workings of the mind.